Houston, TX – OPTIMA, a WindCom® Life Extension Program, has been established to address the aging fleet of wind blades. With expertise spanning 23 years, WindCom in association with the parent company TECSIS is uniquely positioned in the industry to provide a complete turnkey solution. 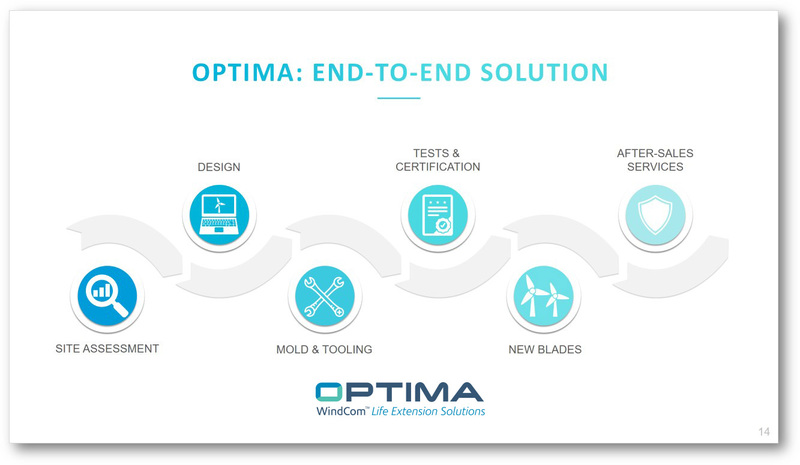 OPTIMA – WindCom® – Life Extension Program includes wind farm assessment, blade design, blade manufacturing, and after-sales services, creating an integrated solution for Life Extension as well as for Partial Repowering. OPTIMA’s solution consists of universal blade designs that fit several wind turbine models operating around the world. Among the numerous benefits of the program, the major ones include the potential increase in wind turbines’ AEP of as much as 30% and LCOE reductions in excess of 10%, with a relatively minor investment compared to developing a new wind farm.